The Halloween party a successful event in the society. Only in this party you can make your guests to afraid on your appearance and with blood-shed decorations. The decorations are made in such a way that it has a spooky appearance. Carving a pumpkin is also an important task to perform in these days. Usually the thanks giving day and the Halloween day are most enjoyed by the children. To make a jack-o-lantern we need to carve a pumpkin. 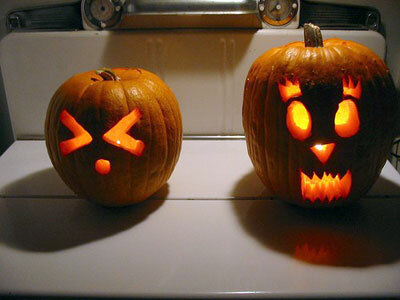 Carving a pumpkin is a hilarious process because you may break it before making the lantern. You need to spend some time to make arrangements for the Halloween party. You can even buy a carved pumpkin but the pumpkin which you carve can resemble your own creativity in that. If you have decided to carve a pumpkin then have these tips which may help you to have a nice carved pumpkin. The first thing you must do before stating to do the carving job is to take and keep all the necessary utilities for carving. List the things like pumpkin, knife, glass, spoons and other carving tools. Have them ready because if you go to them in between carving you may lose the momentum. Don’t use blunt knives; this will not carve the pumpkin in the expected manner. Usually a hole is cut at the top of the pumpkin for carving, but u make the hole in the bottom and then start carving, later you can use this hole for fixing the light. Take out the pulp inside the bumpkin using a big spoon. Save the seeds of the pumpkin which you can use to make a delicious recipe. When the pumpkin becomes hollow a part of the job is over. The next task is to design the pumpkin. Surf the net for pumpkin themes for jack-o-lantern. You will find numerous themes in the net choose a spooky theme and at the same time a attractive one. Now apply that theme on your pumpkin. At most care should be taken while doing this task, because some deviations will make the pumpkin to look ugly. Before cutting the pumpkin to get the design, try to mark the parts you want to cut with some water markers, this makes your cut a neat and keen one. Now color the pumpkin with your desired colors. Don’t forget to apply petroleum jelly on the pumpkin; this will prevent pumpkin from drying and shriveling up. Thus you can carve your own pumpkin. Now place the candle inside it, your jack-o-lantern is ready.